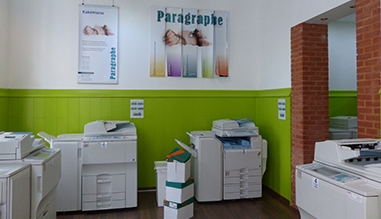 Paragraphe Printing shop has 6 photocopiers ready to use. You can copy a paper document or bring your document on a USB stick. There are different types of paper available and color prinintg is possible. Once your copy is done, Paragraphe Printing can help you by stapling, wiring, thermal stripping or glueing your pages together. A plastic cover can also be added.